As I am writing this blog post, our United States' Center of Disease Control is holding a press conference about the first case of Ebola in Dallas, in the state of Texas. Up to now, this was something that Americans watched in TV. Ebola. It was far away. It happened to someone else. Then, Americans developed it in Africa. Now, it is here, arriving in the body of an individual who arrived in the United States, from Liberia (without symptoms), on September 20. The person showed symptoms several days later, and was hospitalized. The tests have come back positive for Ebola. Plagues are nothing new to mankind. We in developed countries like to think we are better, somehow, than the people we read about in old histories - the panic, the quarantines, the nobility fleeing cities full of dead. Well, we are not too far from that type of behavior. Ebola is a huge threat in Africa. It speaks not just to the health of millions of fellow humans. The Washington Post, a newspaper in our nation's capital, reported earlier today that "Ebola-stricken Liberia is descending into economic hell." For our country? We do not know yet what will come of this. But history has a lot to teach us about epidemics. If you are interested, here is information on some of the worst epidemics in history. The death tolls were, using a modern idiomatic expression, epic. Ebola is only spread by exposure to body fluids from a person with the active sickness. It has a high mortality, even with medical treatment. Sick individuals must be isolated You can see how a medical system could easily be overwhelmed by massive numbers of cases. Of course, the CDC is doing what they can to prevent any such mass outbreak. They knew this day would come. But, increasingly, we are all connected. We breathe the same air (noting that Ebola is not spread by air, but other epidemic sicknesses can be). We travel by air transport to all parts of the world in just hours. Sooner or later, a plague in one part of the world shows up in other parts. So, there is no need to panic (yet) although I will admit that if I was living anywhere near Dallas, I would be a bit more concerned. But, this first case of Ebola in the United States is just the latest example of how we are all connected - for good or for bad. Our challenge now in the States is clear-not only to keep Ebola under control, but to keep our fear under control. To educate all medical professionals is also essential, as health care professionals can spread it. They are our front line of defense, too. How will we rise to this challenge? That remains to be seen. With this post, I conclude several blog challenges I entered this month. Next month? I may taper back. But, I still plan to continue my daily blog posts. This continues to be my personal challenge. When I was young, my Dad would leave the house every day to commute to his job in Manhattan. He always made one stop before heading towards the "El" station where he caught his train downtown. It was to Manny's candy store on White Plains Road in the Bronx. Dad had Manny hold a copy of the New York Daily News newspaper for him to read on the trip to work. He would pay Manny a week ahead of time so he wouldn't lose a minute in the tightly choreographed dance of leaving our apartment at just the right time, spending a few seconds at Manny's, and then climbing several flights of stairs to the Gun Hill Road platform where he hoped he hadn't missed his train. The newspaper was his link to the world. He would usually be able to grab a seat, and he would spend the next hour reading that newspaper from cover to cover. He never missed a day of reading his newspaper. Now, skip forward a generation. Newspapers? My son (mid 20's) doesn't read them at all. I still do. But when I do, I am shocked at the errors I find. I'm not even a professional writer, or a professional proofreader. If I find the most obvious, how many more are there that I miss? On Thursday, I was greeted by this headline for a local event: "PAST tour Saturdat looks at 'Mad Men'-era homes". We could have a new take on a popular song of the 1970's - Saturdat in the Park. All those songs about Saturday night? Time to redo them, too. But let's be serious for a moment. Why should I care if there is a typo in the local newspaper? I was brought up to believe that journalism is all about accuracy. Newspapers had an important function in our society. Doing investigative reporting. Getting "the scoop". Keeping us informed. In our day, though, we depend on other media - media that seems to have turned news into entertainment. It's killing the newspaper industry, so they flail around, trying to find something, anything, to cling to. So far, the industry hasn't found its life line. Sadly, so many people I know have given up on our local newspaper. How can you depend on a story being accurate if a newspaper can't even properly proofread their own stories and headlines? Newspapers all over the country are dying, shutting their doors, laying off people who care about the written word. And meantime, they are consolidating operations. I suspect these errors are slipping through because there's a proofreader somewhere - let's say, in Asbury Park, New Jersey, who is now doing the proofreading for umpteen newspapers where, in the past, each paper did its own. Or, worse - maybe that story was written by a robot. No, I'm not in the news business. Never have been. But newspapers have been a part of my life from the moment I was born. I wish I had something concrete to suggest. I'm fresh out of ideas. If my father was alive, he would be shaking his head. He loved his morning paper so much. Will you be sorry to see newspapers go, if they do go? Or, do you think there is hope for them? On October 5, 2014, a memorial will be dedicated within sight of our nation's Capital building in Washington, DC. The American Veterans Disabled for Life Memorial, will honor all living and dead American disabled war veterans, "regardless of conflict". I could not help but think back to the Civil War. None of the images I saw connected to this memorial seem to be of the Civil War era. Yet, this war made our country, for better or worse (actually, both, in my opinion), what it is today. I hope that the intent of this memorial is to honor the brave men and women (yes, women) who fought on both sides of our United States Civil War. What happened when the wounded vets, many of them amputees due to the state of battlefield medicine in the 1860's, ccame back home after the war concluded in 1865? Have you ever wondered? How many wounded veterans of the war returned? A lot. They numbered in the hundreds of thousands. Experiences differed somewhat for the veterans of the former Confederacy and the veterans of the Union Army. The Union disabled veterans suffered, but one advantage they had was being on the winning side of the war. The disabled Confederate veterans were banned from getting much, if any, help from the United States government (including the granting of pensions to the disabled) by the 14th Amendment to the Constitution. (This was remedied in law in 1958, but by then, most anyone eligible for help had died.) They, and their hometowns (many reduced to rubble as the war was fought mainly in the South), suffered terribly. My father, as my regular blog readers know, was a disabled veteran of World War II. My ancestors did not come to the United States until the 20th century, so I had no blood relatives in the Civil War (to the best of my knowledge.) But, due to my experiences growing up as the daughter of a disabled veteran, I hope that the intent of this memorial extends to those who fought in this domestic war of family against family. I have been in a summer mood the past couple of days. Here in the Binghamton area of upstate New York, it has been so sunny, so warm, and so non-humid that you would think it was a wonderful day in July and not the end of September. With our trees starting to turn color, we decided to drive today about an hour north, into the Finger Lakes. 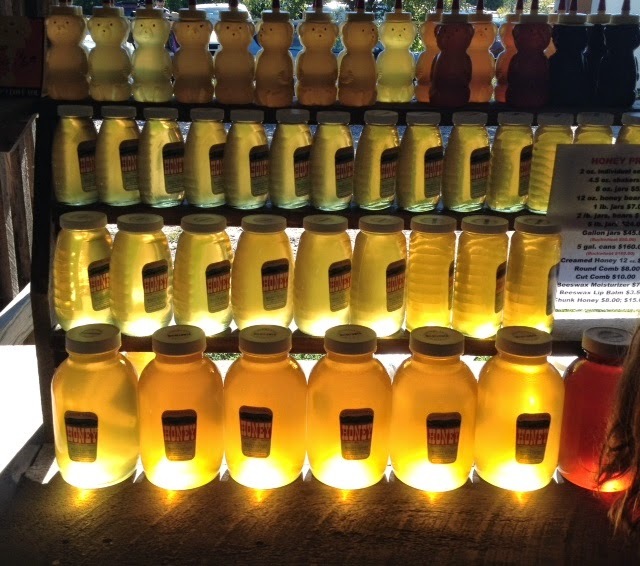 Which is how I ended up seeing these jars of honey, glowing in the mid morning sun. 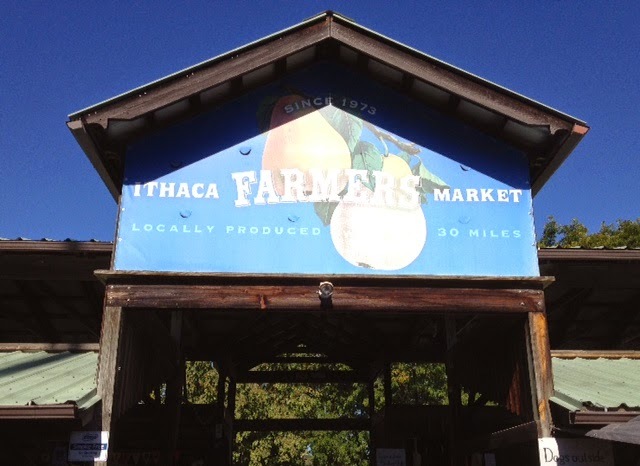 We were at the Saturday Ithaca, New York, Farmers Market, one of the best in the country. It is located on the shores of Cayuga Lake, one of the Finger Lakes of upstate New York. 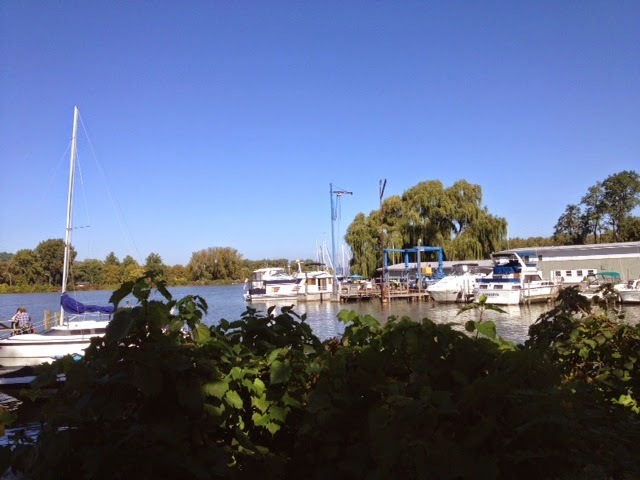 Nearby, people can dock boats. Along the market side of the lake are picnic benches, where you can sit and watch people or nature. It is unfortunate that some of what they sell is quite expensive, but there is also a lot of more reasonably priced produce. 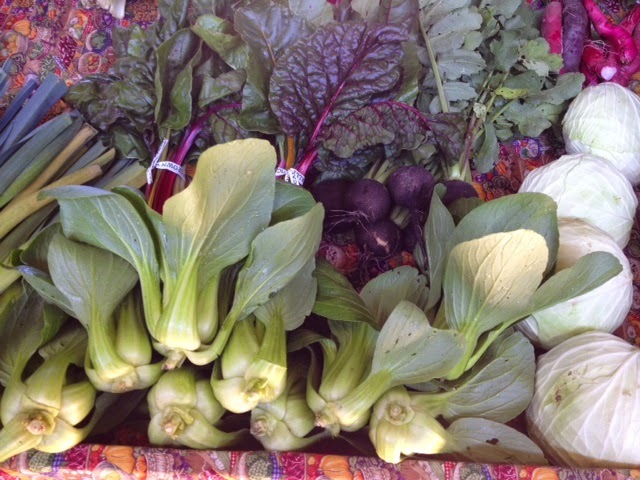 A lot of it is organic, and market rules demand it must be grown within 30 miles of the market. Nature paints with such lovely colors, doesn't it? We aren't that far from the end of the growing season. If we had weather like this every day, we would quickly take it for granted. But we know that the bitter winds of winter will soon blow. The days grow shorter every day, and more and more trees turn color every day. These days are precious, and numbered by nature, even as it paints us an apology for what is to come. One day, our frost will come, followed by the first freeze, and then the first flakes of snow, tumbling out of cloudy skies. And the markets will move indoors and hunker down for the cold months. But for now, honey glows and produce sings. 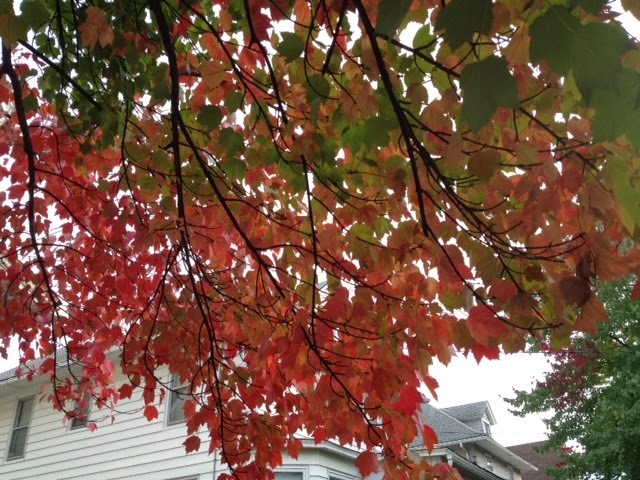 Would we appreciate fall as much as things looked the way they do every day of the year? Here, we commonly get morning fog in late summer and early fall. 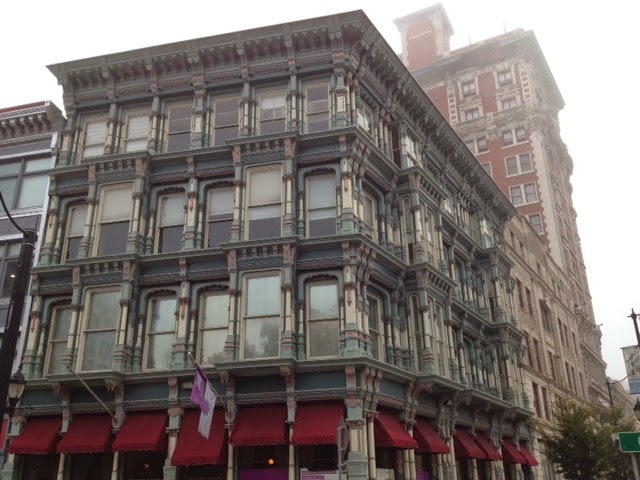 I love the muted colors in this shot taken today in downtown Binghamton, New York. This building, the Perry Building, is an amazing blue in the noonday sun. Here, it looks more grey. In the fog you can see another historic building damaged by a fire, the Press Building, behind it. Our library, on the edge of downtown, has a garden. A historic mansion (Phelps Mansion) and a historic church are in the background. 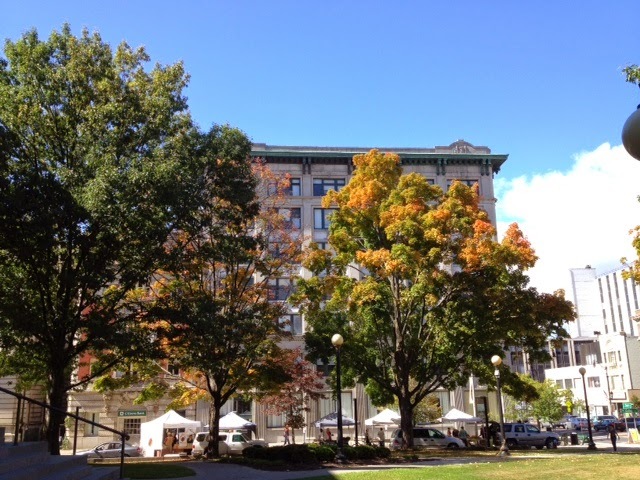 At lunchtime, the sun is out brightly, in this long shot showing trees starting to turn and the small downtown Binghamton farmers market. 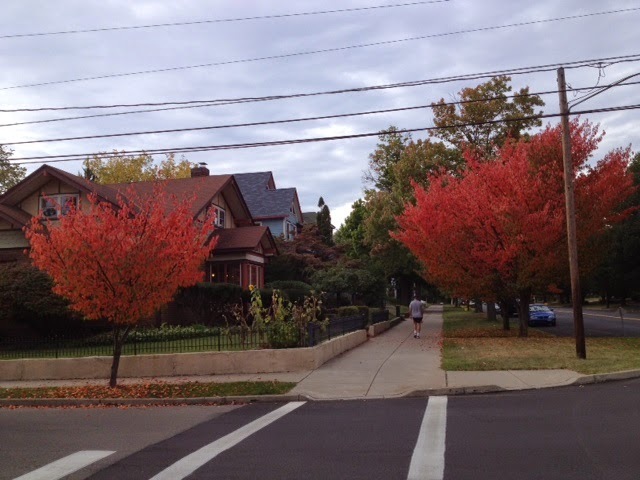 After work yesterday, I saw red trees blazing on Grand Boulevard on the West Side of Binghamton. Despite the clouds we had yesterday, it was so pretty. Would we pay attention to trees if they looked like this every day of the year? I doubt it. Instead, we have fall foliage forecasts with predictions as to when peak foliage will occur. I don't know what kind of trees these are. They are already brown, as you can see in this photo taken tonight, but someone has dressed them up with orange bows, and mums along the ground add more color. 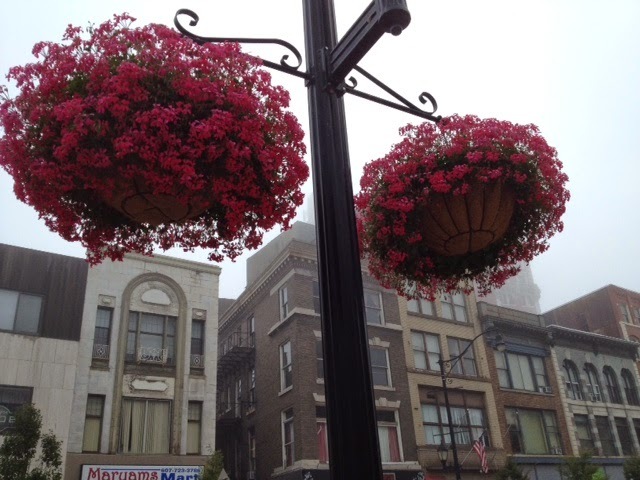 Fog and fall go together in upstate New York just like - well, fog and fall. What kind of weather are you experiencing right now? Can smells disappear, never to be smelled by anyone again? Do you have a special smell of childhood? Think about it - does that smell still exist? I remember the scent of the lobby of the apartment in the Bronx where my mother's mother and father lived. I remember the smells of cooking food. The building still exists (it was built in 1930, and was converted to co-op housing many years ago) so perhaps those smells still exist. Please, someone from England, tell me you don't cook cabbage all day any more. But the smell my spouse associates with fall - the smell of burning leaves - is a smell that exists in fewer and fewer places, as the practice has been banned in many United States municipalities. Those aren't the only smells that are disappearing, either. It's doubful that teens or those in their twenties remember the smell that vacumn tubes made when they were in the warming up process make - except, perhaps, for my son. Old technology fascinates him. How many people, as another example, remember the scent of mimeograph (ditto) sheets? And, while we are at it, have you ever wondered why someone on an email is "cc"d" (as in carbon copied)?. Is there a smell from your childhood that no longer exists? 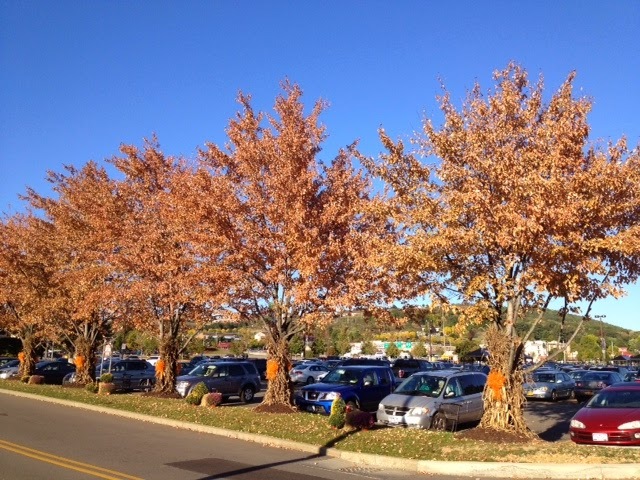 Fall has come to the Binghamton, New York area where I live. Fall is meeting summer and preparing to take over. Our weather, this week, is actually warming up and is sunny and pleasant, but the plants aren't fooled. 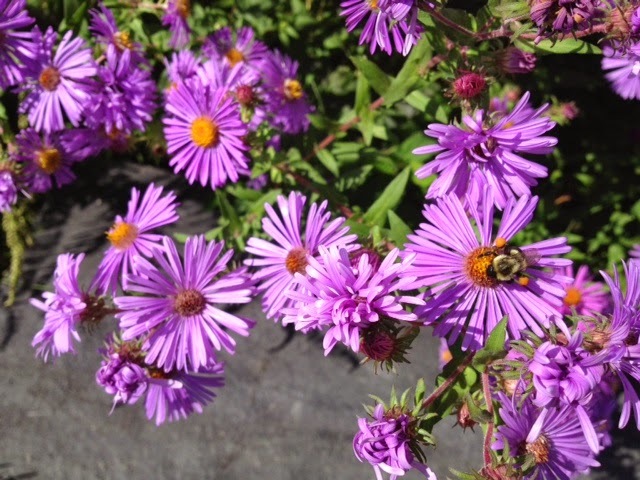 Bee on an aster, along the Chenango River in downtown Binghamton. 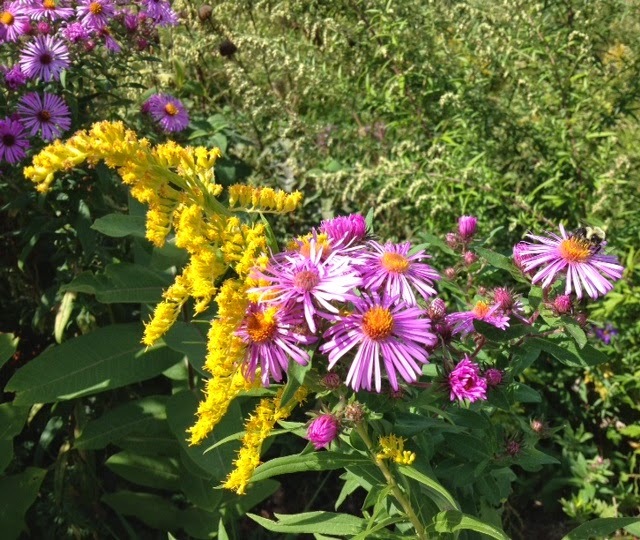 Also along the Chenango River in downtown Binghamton, asters and goldenrod bloom side by side. 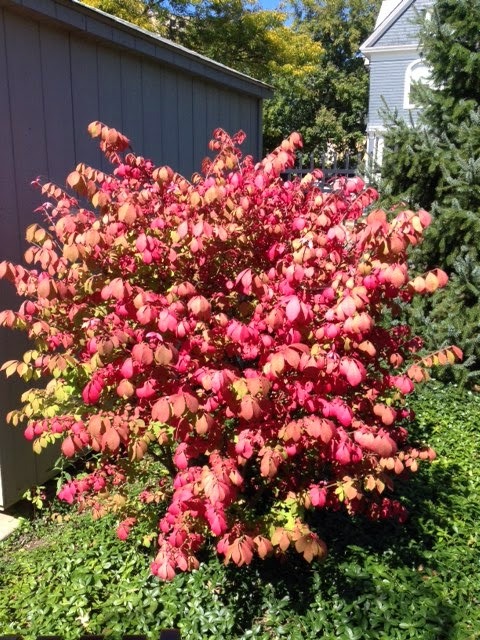 "Burning" bushes are coloring up. 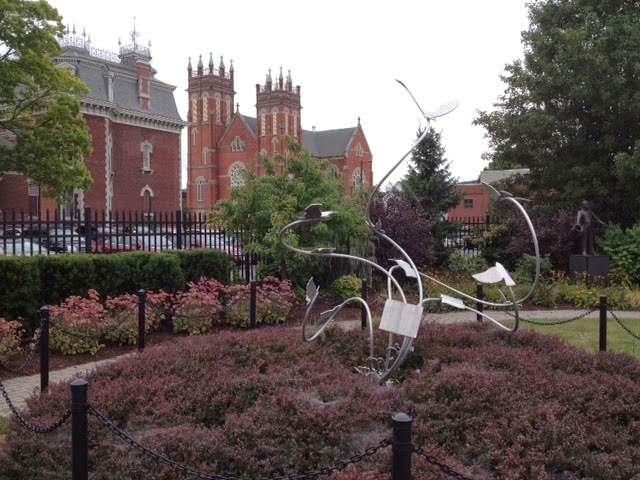 This one from today is in the library garden at the Broome County Library in Binghamton, New York. Soon enough, with the first frost, summer will give way to fall. For some, it is the best time of year. My "Summer Ramblings", in honor of the second day of fall, have transitioned into "Fall Fancies". Every Wednesday until winter, I will blog about something seasonal. Do you live in a four season climate? What is your favorite season, and why? The sun started to rise today over this building in Westover, near Johnson City, New York. Main Street, Westover with former BAE building on right. It was the golden glow of goodbye. This building was one of the largest wood framed structures in the United States when it was built during World War II. It is also known as Air Force Plant 59. Built in 1942, it sits on 30 acres and the building (actually, several buildings, a couple possibly of historic value) totals some 612,000 square feet. What you are seeing is a very small portion - most of it is not visible from where pedestrians can see it, just the very front. 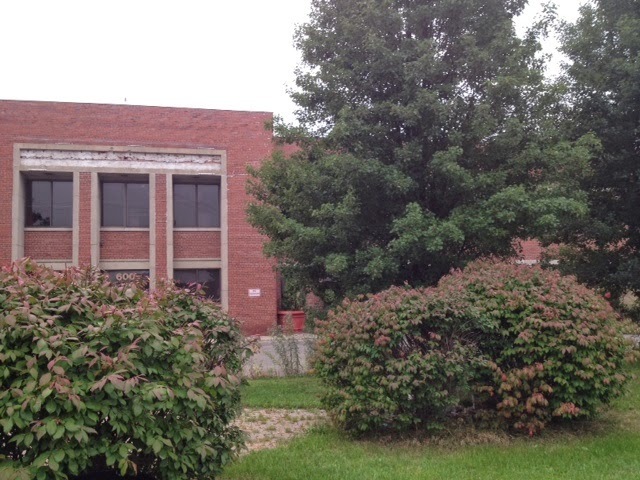 Until September 8, 2011 this building, in walking distance of my house, housed a series of defense contractors (including, at one time, GE, and Martin Marietta), and, on September 7, 2011, held some 1300 employees of BAE Systems. On September 8, 2011, the building was severely flooded during Tropical Storm Lee. A salvage effort followed. But, in November of that year, the building was deemed unsalvageable. Our area came close to losing the 1300 jobs, too. As it was, when those people left, many local businesses suffered. The jobs, for our neighborhood, may never be replaced. 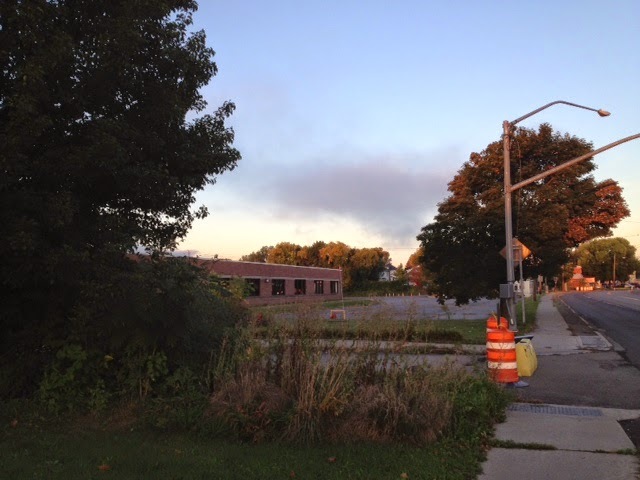 Since then, the building has sat, vacant, a blight on my neighborhood. Weeds line the walks and grow in the parking lot. Now, birds and who knows what else inhabit the property. Former landscaping plants still show color-tulips in the spring, daylilies, and finally, bushes coloring up for fall. 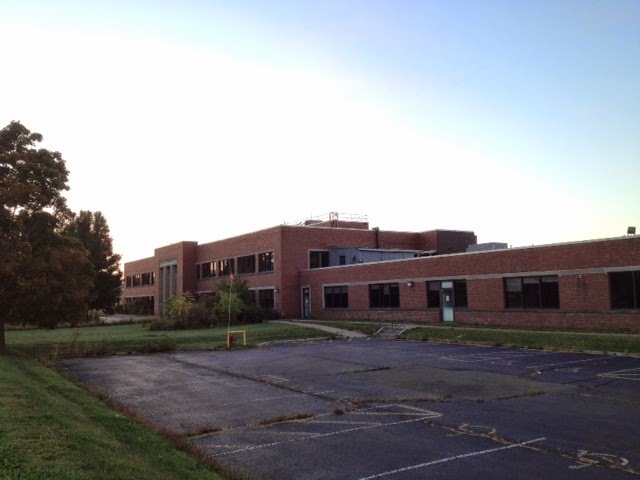 Now, bids are being sought to demolish the former BAE facility. The winner of the contract should be named, perhaps as early as the end of September. Demolition is supposed to start soon after. Although, I'll believe it when I see it. I have blogged so much about you, former BAE building. Through your Bradford Pears blooming in the spring, through Oreo snow, through fall color. Now our neighborhood, like so many in our area, face a "defining moment". What will happen to the property? Our neighborhood's future may be in the balance. There are several possibilities. "To Be Continued - Eventually". For now, there is only the golden glow of goodbye. In my yard, there is a small garden statue. 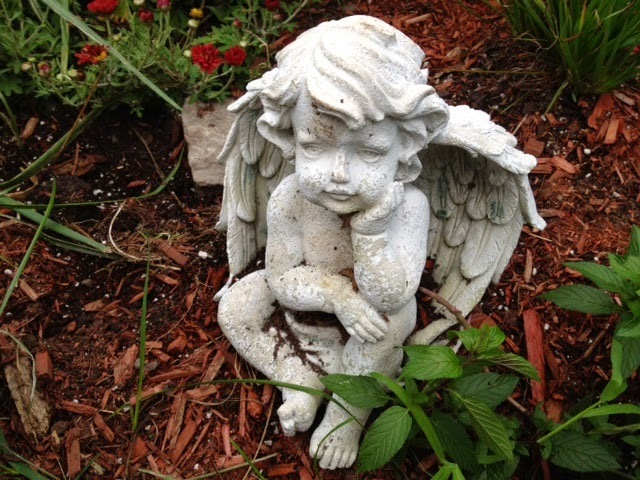 It is weatherworn, but the angel sits in my yard, deep in thought, watching the insects and birds that visit my front yard flower garden. The angel didn't always live at my house. Three years ago, it was for sale at a nursery near Owego, New York. On September 8, 2011, Tropical Storm Lee hit the northeast United States, in followup to another tropical storm days earlier (Irene). Our soggy soil could not hold the 10 some inches of rain that Lee dumped on us after our rainiest summer on record, and Lee triggered massive flooding. My neighborhood of Westover, near Johnson City, New York was hit hard, as my regular readers know. Owego was hit even harder. The nursery, after it reopened, put various salvaged goods up for sale at reduced prices. In a pot was a Persian Shield (the reddish plant with the large leaves-Strobilanthes dyerianus) that had survived the flood, and I somehow knew I needed to rescue it. Then, I saw the angel. Today, the original Persian Shield lives in my office, and I've had cuttings grow outdoor in pots the past three summers. 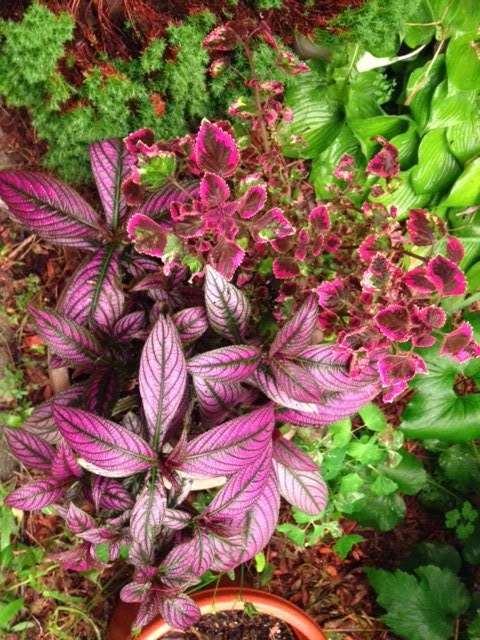 The plant has been a joy for me with its shiny red leaves. And the angel is my Flood Angel. It watches over me, and my neighborhood. Why does my neighborhood need a flood angel? Slowly but surely, the houses that were so severely damaged they could not be saved, are finally being demolished. 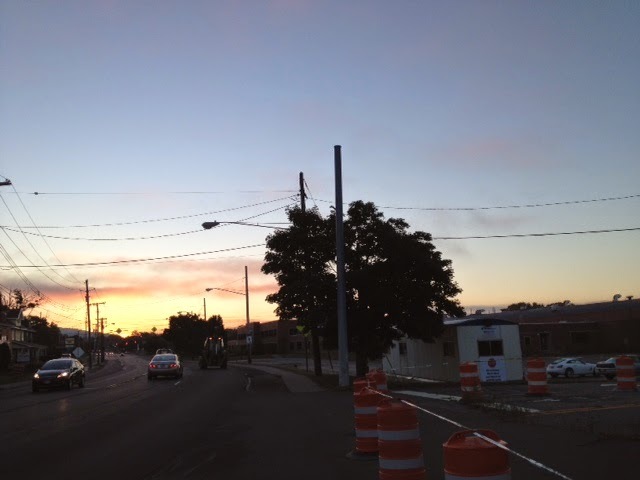 Now, this past week, we got some news that our neighborhood had been waiting for, since November of 2011. A neighborhood is more than just a collection of buildings. And, for us, hope is a wonderful thing. Perhaps now, we can finally start to move forward. Sometimes, the United States Civil War has connections that lead us to unusual places, if only we are willing to travel down those old, winding roads. I always love a good story, and this story is a good one, complete with a myth that causes thousands of people to visit a small city in upstate New York every year, just as I did earlier this month. In early September, I visited a museum, and saw this portrait. It's of a Union General. In his early life he was a civil engineer. But the exhibit had nothing to do with the Civil War. The man in the portrait fired the first defensive shot of the Civil War, at Ft. Sumter, in Charleston Harbor, South Carolina. He was second in command at the fort. He fought at Second Manassas and Gettysburg. A statue of him stands today on the Gettysburg battlefield. Later in life, after the war, he established San Francisco's first cable car company. And today, no one seems to care that this man even served in the Civil War. His name, instead, is connected with something else, a something in the lives of many Americans each summer. 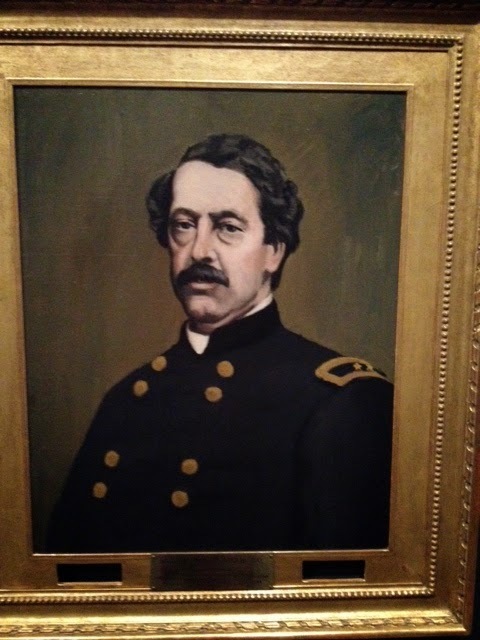 That is why this Civil War portrait of a New York State native hangs in a sports museum in Cooperstown, New York. It may have something to do with this photo I took a few evenings ago. 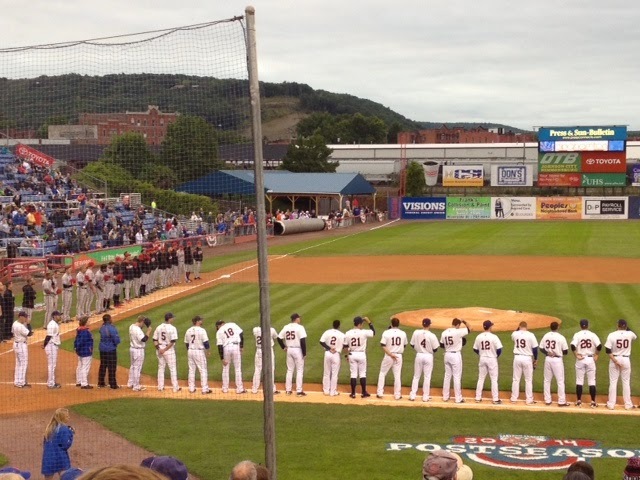 Here, at a minor league championship baseball game, the opposing teams line up - the Richmond, Flying Squirrels (Virginia) vs. the Binghamton Mets (New York). That championship game would have been impossible during the Civil War, as our nation split in two, and Richmond served as the capital of the Confederate States of America. New York, meantime, stayed with the Union. 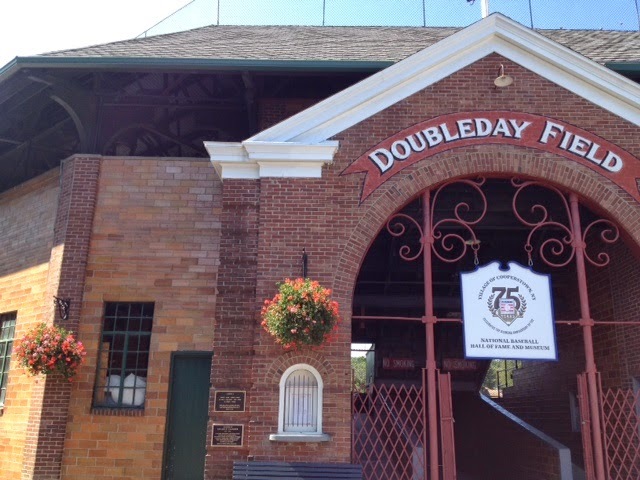 Let's also note this structure in Cooperstown, New York, where I saw baseball immortal Bob Feller pitch back in 2009 (he has since passed away), named after this man. 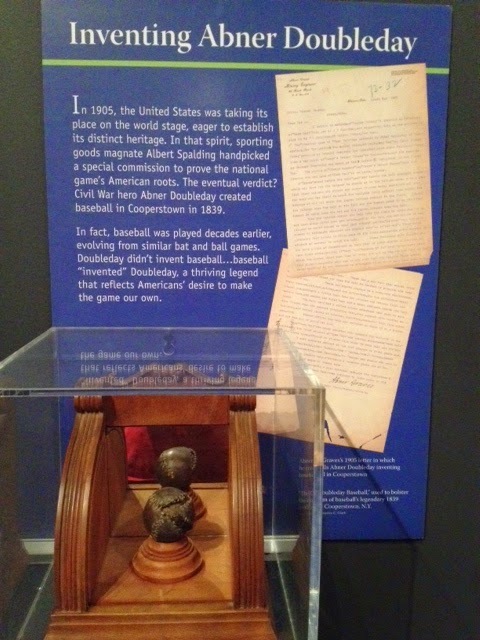 Cooperstown, New York - the site of baseball's Hall of Fame. All because of Abner Doubleday. For many years we who grew up in the United States loving baseball were taught a story-that Civil War general Abner Doubleday invented our national sport around 1845, some 16 years before the Civil War started. Too bad it isn't true. (Probably). But the story refuses to die. And, in truth, the Civil War (1861-1865) helped to make baseball, which was a regional game enjoyed in the New York State area prior to the war into the sport it is today. New York soldiers serving in the war taught the game to their fellow soldiers. In down times between battles, the game helped to pass the time. The military leaders promoted the game among their troops. The game then spread to prisoner of war camps on both sides of the war. In some POW camps, towards the beginning of the war (before the horrors of Andersonville and Elmira, among others, got underway), baseball games were organized. Sometimes, Union ballplayers even played Confederates. It was sobering, seeing a championship game between a New York team and a team from the former Confederacy earlier this month, to realize that one of the few good and decent things that came out of the Civil War was baseball. Even if Union General Abner Doubleday (probably) did not invent it. Do you have a tiny urban plot? Or, is your back yard too shady to grow food crops, as mine is? Don't despair. It is possible (although not always easy) to grow food plants under less than ideal conditions. I do not have deer problems at my house, but have tremendous problems with groundhogs. So everything listed here is groundhog-resistant but I can't vouch for their ability to withstand foraging deer. One solution is container gardening, which I will blog about another time. Why have only a lawn? 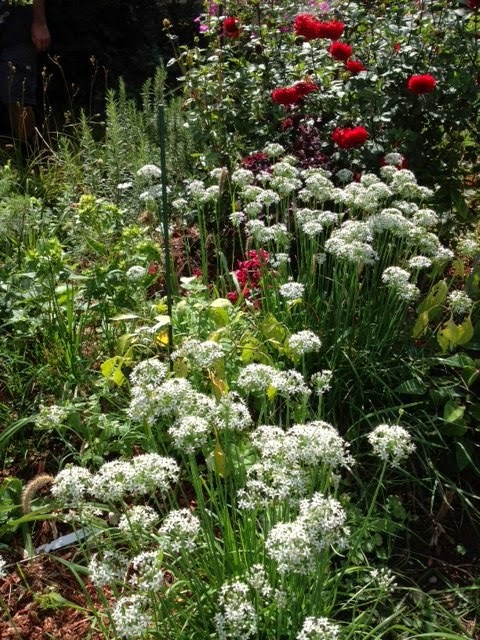 Unless you are unlucky enough to have neighbors who object to this, you may be able to sneak some ornamental, edible plants into a flower bed. 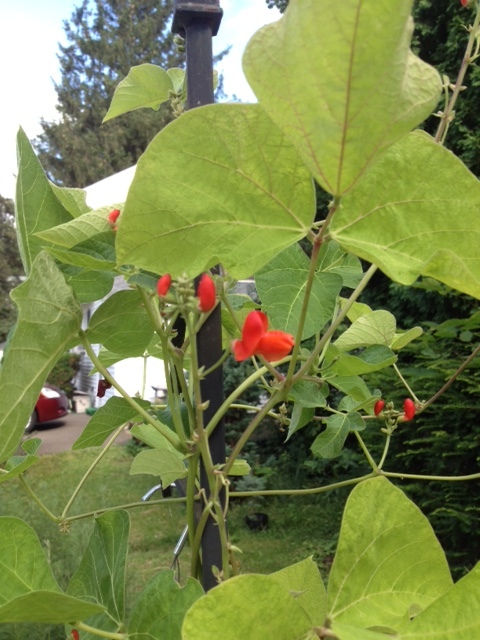 These scarlet runner beans were in a large flower pot in my front yard last year. We put fencing around it when they were younger due to animal damage. The harvest was not as great as if we had put them in the ground, but we did get some beans. I've entertained you with pictures of my yard this week, so wanted to share this picture from last year with you. Every year I do something a little different. In the front of the photo, I had pepper plants on the left side, orange gem marigolds (edible flowers) on the right side. Groundhogs do not disturb these. 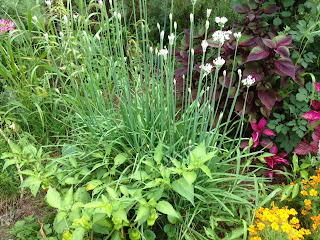 Behind them - garlic chives (beginning to bloom with white flowers), perilla . As with flowers, you would prepare your soil with compost and make sure you keep plants watered. Pick your veggies frequently for best results. 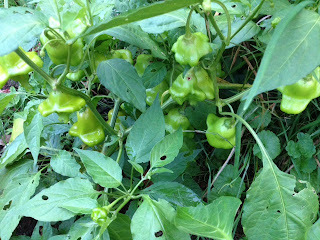 Here's a closeup of one of the peppers I grew last year in my front yard, called Bishop's Hat. They were quite hot. This year, I am growing several "fool me" jalapenos in my front yard. I have an ornamental Perpetuo basil plant - and yes, it is a very good culinary variety. I am growing this again this year. You will note no brassicas, and no lettuce. 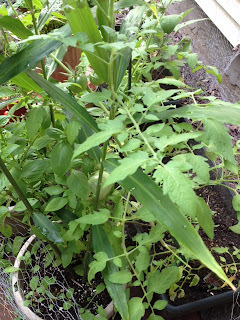 Groundhogs, alas, are too fond of these food plants. If you can grow them, though. lettuces are quite ornamental, coming in various leaf shapes and colors. Last year, I grew tomato, basil, and ginger in one pot. Yes, I grew ginger in upstate New York. I used a technique described by a fellow blogger and I got a good harvest. This year, I am growing ginger by itself - not all the rhizomes germinated but the plants, right now, are several feet high. 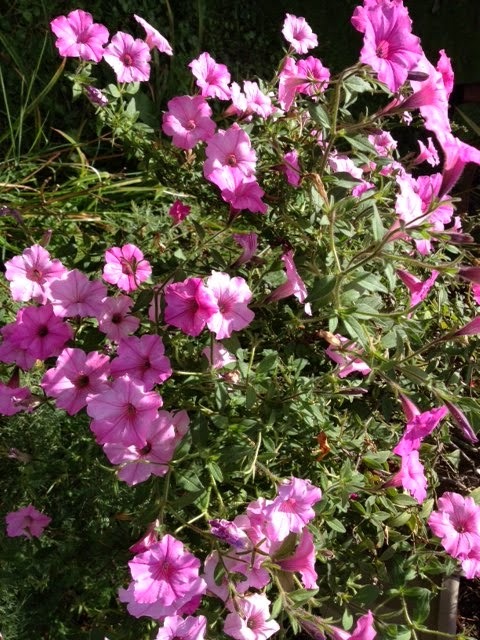 Have you ever tried sneaking ornamental food plants into your flower beds? How Did the Baby Boomers Get Online in 1958? A "personal favorite" posts from the first years of my blog, edited a little. My son is no longer a teenager. And he never did locate a Betamax player. But we have enjoyed obsolete technology together - such as my old reel to reel recorder from when I was a teenager. I'm still a bit surprised that my son never decided to open a Museum of Obsolete Technology. No, wait, there is one - his room. (Only kidding, dear son, especially as you live on your own now). Still, don't you think this Betamax commercial is just a little touching, even if it is obsolete? Next, let's consider my iPhone 4S. With the release of iOS8, which I dare not install, my phone would become (if I did install it) what young people call "a brick". When I got my first computer, in 1996, would I ever have imagined that one day my phone would have more capabilities than that computer? Or that I would use my phone to go online? No. So How Did The Baby Boomers Get Online in 1958? First, I am not trying to mock my teenage son. But it shows how, in some ways, the mindset of the present generation is so much different from those of us born only 35 or 40 years earlier. My son knows about what the computers of the 1950's looked like. People of my baby-boomer generation, do you remember the UNIVAC? Do you remember the famous "hoax" picture of the 1954 RAND prototype of the first home computer? Maybe that was what son was thinking about when he asked his question. One evening my son asked me "how did you get online when you were growing up? Did you have one of those huge computers in your bedroom?" I thought he was pulling my leg. Although he intellectually knew there was no "internet" as he knows it back in the 1950's or 1960's, he had to believe that there was something out there, just something very clunky, probably in black and white, and using technology full of vacuum tubes. Interestingly, son is also very interested in "old technology". For example, he is looking for a good Betamax player (and has several Betamax tapes). He just couldn't make that intellectual leap of people living before certain technology existed..
Let's think about this a minute. I bought my first home computer (a bit later than other people, I admit) in 1996 and went online in January of 1997. So my son was in early elementary school at the time. From his viewpoint, there was a computer in his life "forever". By the way, when did the Internet start? The answer is complicated. This link has quite the discussion and the answer is..."it depends". Do you remember life before "online"? Or, has there been a computer in your life "forever"? 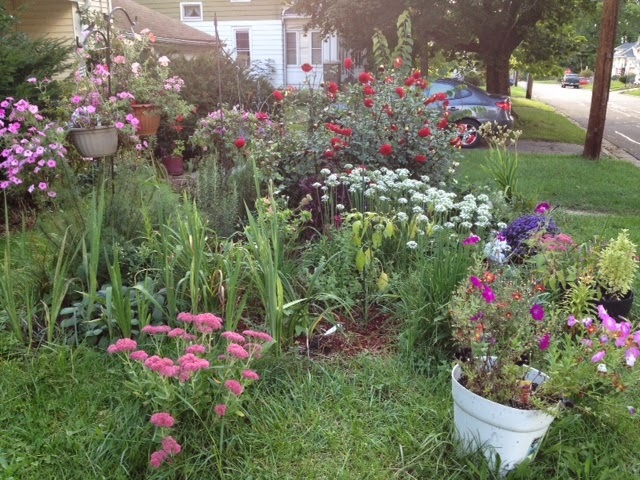 I am pleased (and amazed) at the response my post of yesterday, about the stories my front yard/flower garden tells, got. I shouldn't say "my" garden - my loving spouse of 40 years is responsible for a lot of what you see, especially when my back gets cranky. So I told my spouse he now has fans from all over the world. His reaction? "I should hope so." He doesn't read my blog - he doesn't do all that much online, bu he patiently puts up with my online meanderings. So drop him a comment at the end of today's post and thank him. Today, I'd like to tell you some more stories about my flower gardens. In the center bottom of the photo above, you can see some white marigolds. 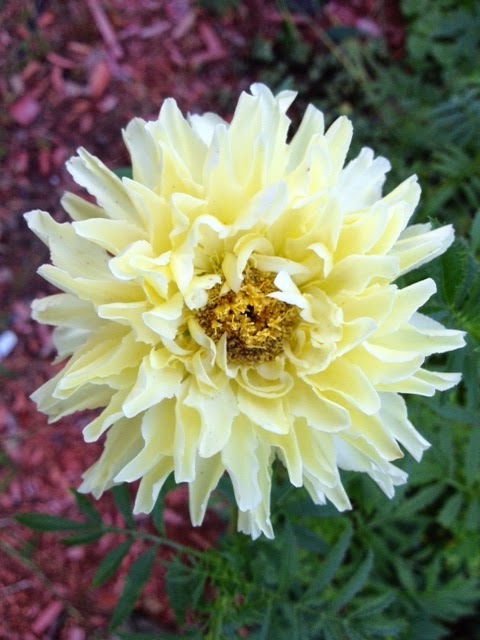 Another reader of a post this week reminded me of a time, long ago, when Burpee ran a contest for its customers - the winner would be the customer who was able to provide Burpee with the seeds of a true white marigold. The stones you can barely see at the bottom of the photograph - those are from some of our travels. In 2002, we visited the Crazy Horse monument in South Dakota and we were permitted to take stones blasted from the mountain that is being sculpted into the monument. The story of the Crazy Horse Monument is epic and I don't use that word loosely - I encourage you to read about it. I also want to share a couple of pictures of my shady back yard with you. This pink turtlehead hails from Asheville, North Carolina, a milder clime than ours. Some people buy souvenier t-shirts or mugs when they travel. I buy plants and garden decorations, as I mentioned yesterday. Many of the plants I buy are from warmer areas, and they don't survive our harsh New York winters. 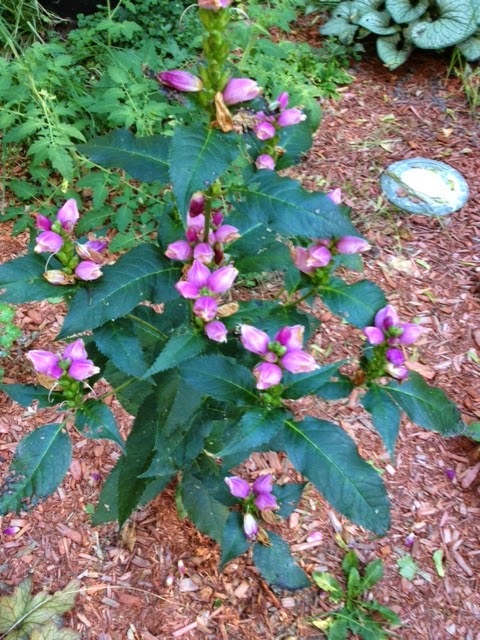 But sometimes they do survive- like this pink turtlehead. Our back yard tells its own story. Many years ago, the late Joan Gibbs, of Gibbs Perennial Gardens in LeRaysville, Pennsylvania,taught me the secret of shade gardening. Don't strive for showy flowers, she warned, because you rarely will get them in the shade. (Although, that turtlehead is an exception, don't you think?) Instead, look at leaves. See the colors, the shapes, the shading, she continued. Look at how plants look in each season - spring, summer, autumn, and winter. That's what you want to strive for. And with her advice, that is how I started my part shade/shade garden in the back of my house. Such good advice she gave me. Observe, and be willing to change how you think. Discard what you've already learned. Keep an open mind. That works for such much more besides gardening. So, those are my stories for this week. Do you want to hear more garden stories? I have so many to share. If you like what you see, comment, and "like" my blog's Facebook page. I will respond to all comments (eventually), although I'm a bit behind right now. This is my last Summer Ramblings post. 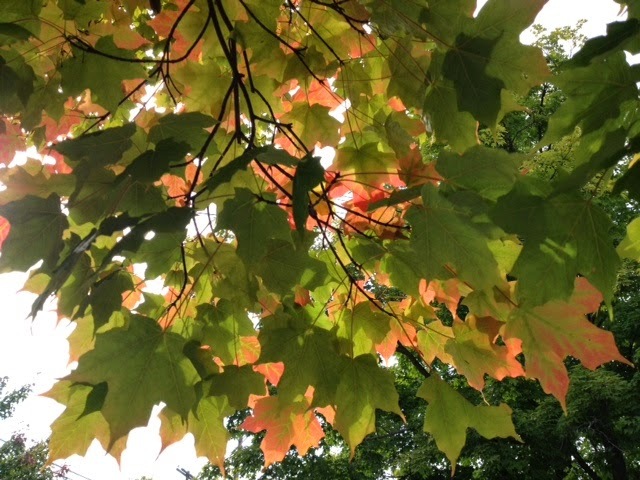 Fall begins on September 22, at 10:29 PM. Chances are I'll be fast asleep when it comes. I like autumn, once I am dragged, kicking and screaming, into it. One of the truths of fall here in the Binghamton, New york area is that nothing in our four season climate is permanent. The sun is rising later each day, and setting earlier each day. Each time it gets cold, it never gets quite as warm again when the cold front has passed through. One day I will wake up to a blackened garden, and soon after that, colored trees. Next, the icy winds will start to whip. Already, I can envision ice and snow on the ground. 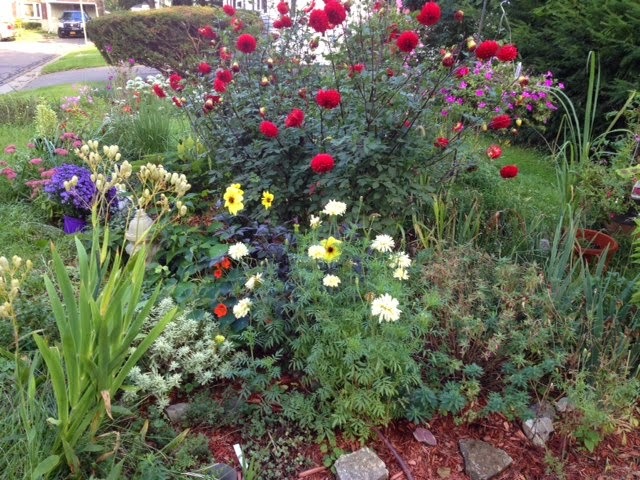 A couple of days ago, one of my blog readers asked to see my front yard, not just individual flowers. I am not a lawn lover. I do have grass on my lawn, but because my front yard is the only sunny area my small plot of land has, we have our sun perennials in our front yard. After all, you wouldn't want to see a bunch of lawn grass pictures, would you? So I thought, "why not end summer with pictures of what my yard looks like now?" I took some of these yesterday evening and others after work today. The lighting was not perfect last night, with all our clouds. But, face it, upstate New York sees more clouds than some places. Well, many places. Sometimes, we spend weeks in dull light and then wonder what that bright ball in the sky is, when it finally appears. I will be quiet now, and let my front flower garden tell its story. 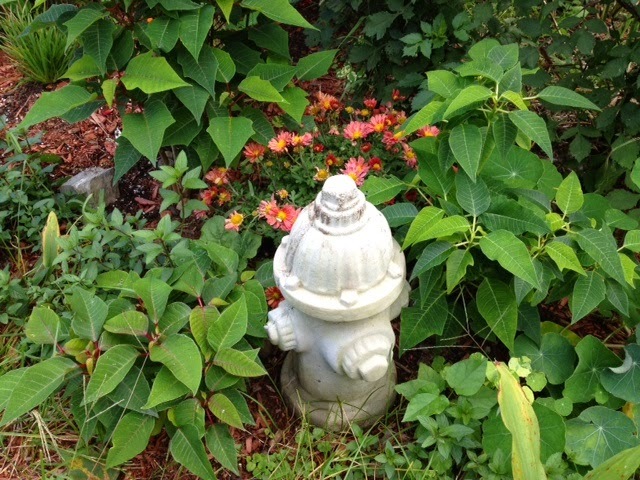 First - why is there a concrete fire hydrant in my front yard? Wouldn't you like to know? The answer is simple. Some people buy souvenier T-shirts, or mugs, when they travel. But not me. I buy plants and other stuff for my yard. I picked up this concrete fire hydrant in a store in a farmer's market (there, that means a permanent market and not a place where farmers come and sell out of their trucks) in North Carolina. I saw that fire hydrant and it just called to me. Why not? I don't want to be ordinary. The plants are poinsettias from the last holiday season, which I hope to get to rebloom this winter in the house. These plants are not hardy here. In the back is a hardy mum. 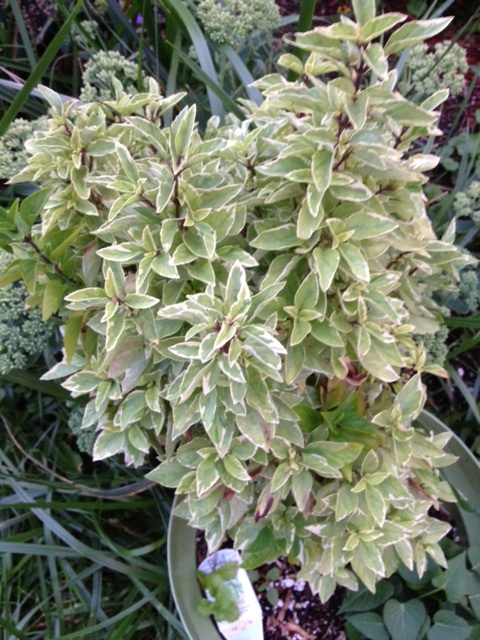 Above, in the lower left, is sedum (the low pink plant). That was given to me by a friend. In the white pot are heirloom petunias I was able to buy this year from a locally owned nursery. The white flowers are garlic chives. 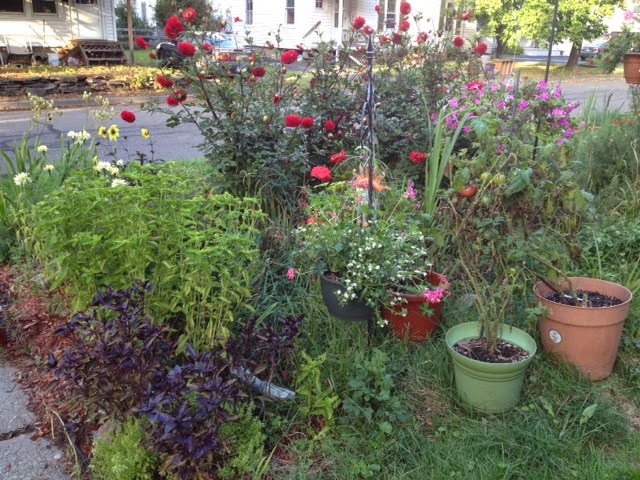 The red flowers are my dear red dahlias, given to me almost 20 years ago by a work friend who passed several years later from cancer. We must dig these up each year and then replant in the spring. It's been an honor to preserve the plants she entrusted me with. Here, on the left side are purple and green basil, and white marigolds. There are also a couple of pots with tomatoes, and several hanging baskets. Like my garden's story so far? Do you own something odd that you display? I will continue this story in a future post. What's the Next Best Thing to an Auctioneer Checkout Clerk? I love clever commercial, like this one. Can you imagine an auctioneer as a checkout clerk? 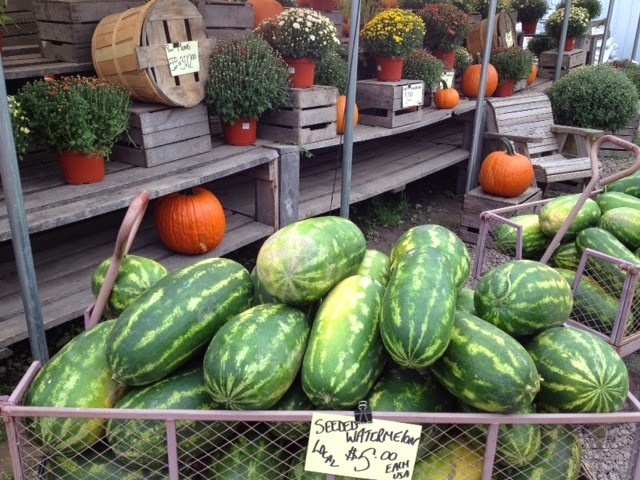 Neither can I, but a large farm stand in Bainbridge, New York, has the next best thing. And I so wish I had a video of him in action. Frog Pond Farms, I'll be the first to admit, is a mixed bag. Not all the produce it sells is locally produced. Not all of it is high quality, either., I'm sorry to say. You have to be careful. But, especially if you buy in bulk, the savings can be amazing. And people come from miles around to buy there. We've been there three times this year. They do label the produce as local if it is local. If it isn't marked, it isn't local. You can buy local, or not, as you choose. Despite its shortcomings, I still like the place. Even on a Saturday, when it is so crowded you can barely move, I like it. There is a corn pit where children can play. There are pigs for the children to watch. There are local cheeses, and fresh eggs for sale. 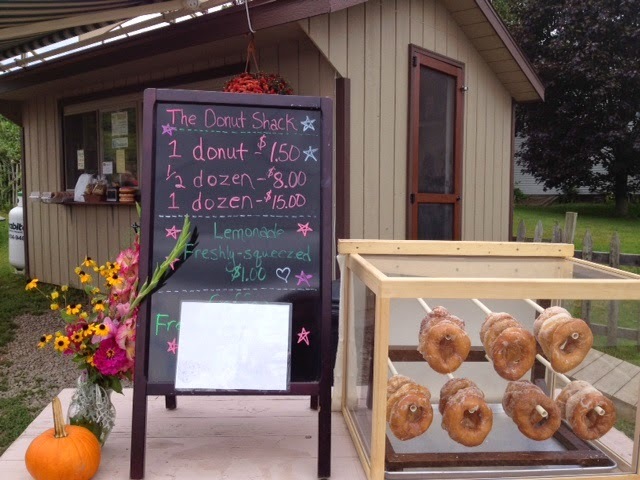 There is a donut stand. I'm not a fan of donuts (a holdover from a long ago job in a donut store) but donuts are perfect for this type of store. 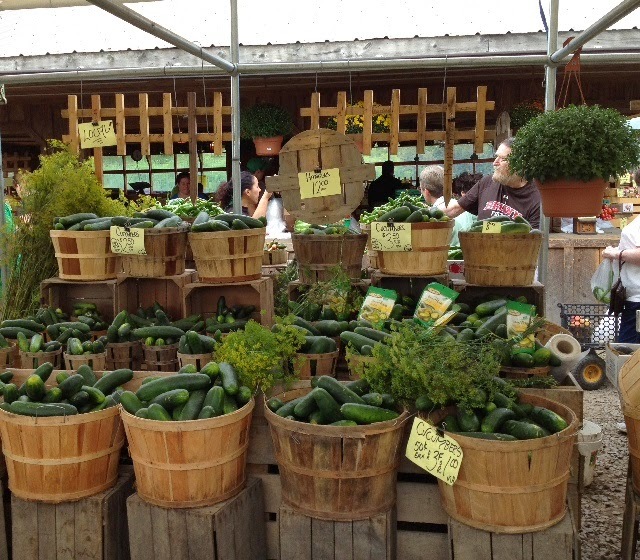 Frog Pond lets you sample the produce if you want, as long as you eat it on premises. The best attraction of all, I think, is the man who works there at the checkout, weighing, calling out the prices in a stylized sing song like an auctioneer, and adding them all in his head. He does the weighing, too. He's been there for years and I wish I knew his name. In fact, I wonder if he is the owner. Not too many people do mental math in public anymore. I wonder if he has children, and if he's taught them that skill. I wanted to bring you some of the magic of Frog Pond, as we transition from summer to fall. I don't make that transition without a lot of kicking and screaming. These pictures, in fact, were taken the last week of August, but you can see the transition in these pictures. We aren't that far from frost now. 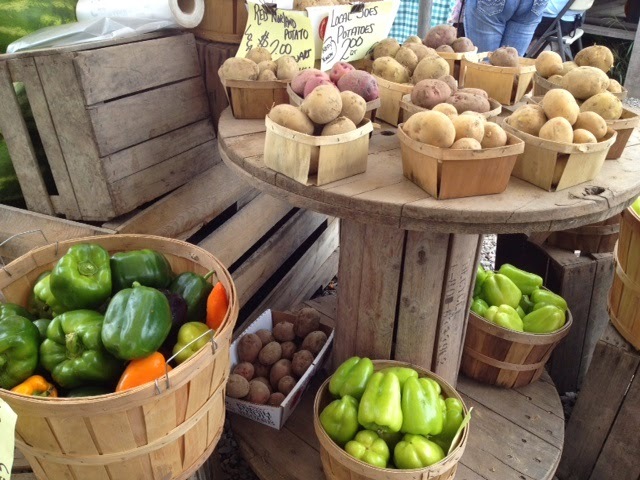 If you went there today, you would find grapes, winter squash, pumpkins, and mums, and lots and lots of apples. And a man who, perhaps, should be in the next Geico commercial. 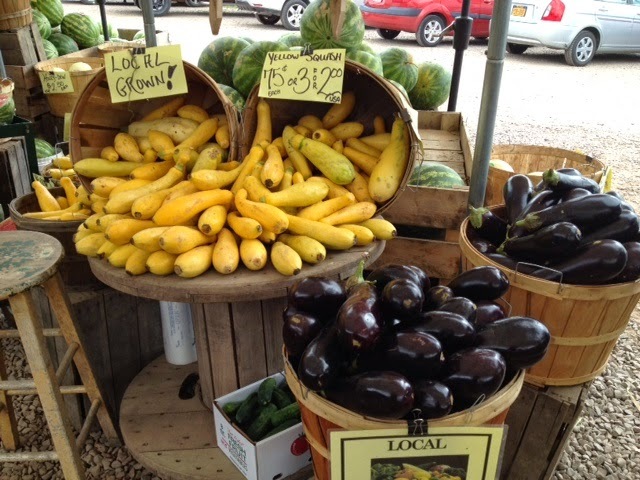 Do you have a favorite farm stand? Or a favorite checkout person where you shop? That's what everyone is saying this morning here in the Binghamton, New York area. Friday, it didn't even get out of the 50's F (15 Celsius). But thankfully, we did not have a frost, unlike some other parts of upstate New York. In fact, I woke up to a temperature of 50 F (10 Celsius) and it was such a relief. 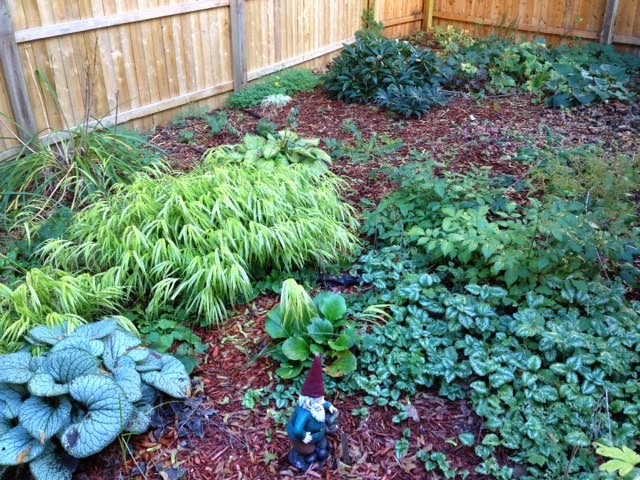 That allows me to go out and enjoy my outdoor garden, knowing it is safe from frost for at least a few more days. I hope. Right now, these are blooming in my garden. 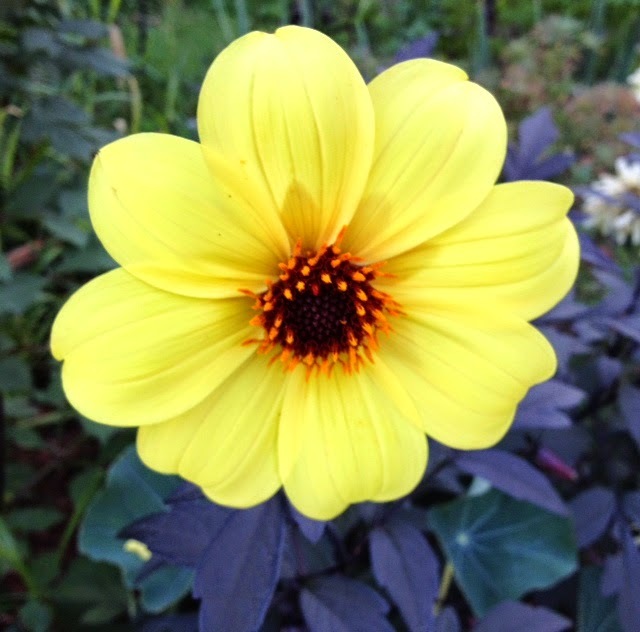 Yellow dahlia. (My first year growing this, and I already forgot the name of the variety. Its lovely foliage is tinged with purple). Our garlic chives have been bountiful this year. In the background you can see the red dahlias a late friend gave me some 20 years ago. 20 years of digging and replanting, and this may well be their best year ever. 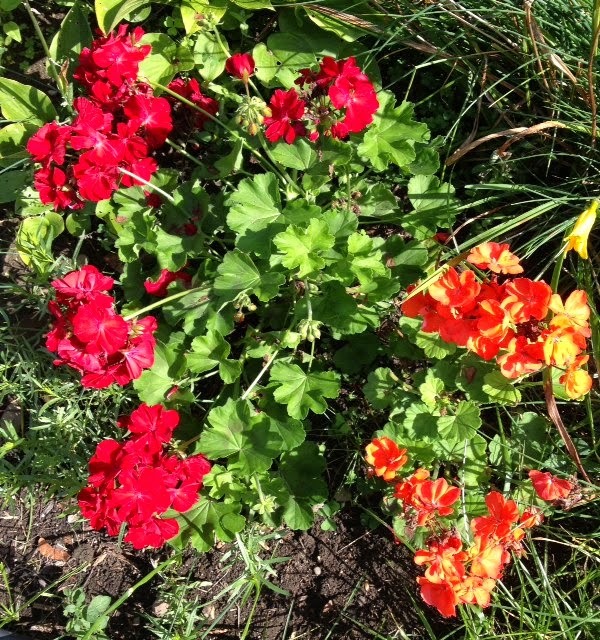 Red and orange geraniums, side by side. This year, we have a mum that overwintered and is blooming! This picture was years in the making. 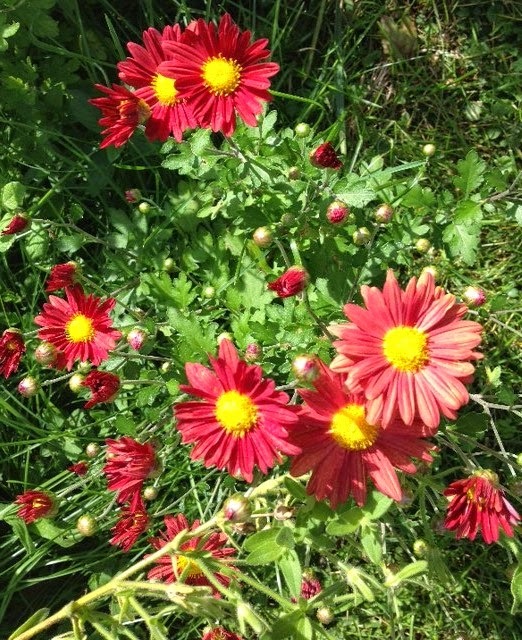 Hardy mums are becoming more popular in our upstate New York area, and one local nursery that sells these does not charge that much more than for the greenhouse varieties that never survive our zone 5b winters. So, we bought two more this year, from Sticks and Stones Gardens. We bought this unnamed flower plant at Wegmans (a New York based supermarket chain) yesterday morning. There were a lot of plants for sale Saturday. Sunday, there was this lonely specimen. It will be going into our front yard near the mums. 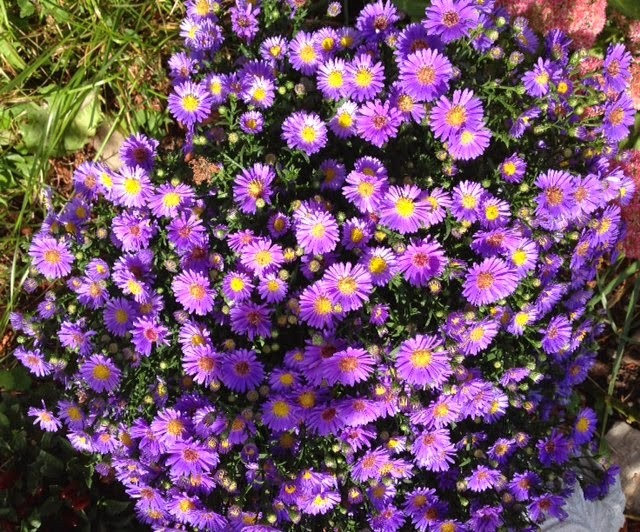 I wonder if these are Michaelmas daisies but I will call them asters. I'm sure one of my readers will correct me if I'm wrong. 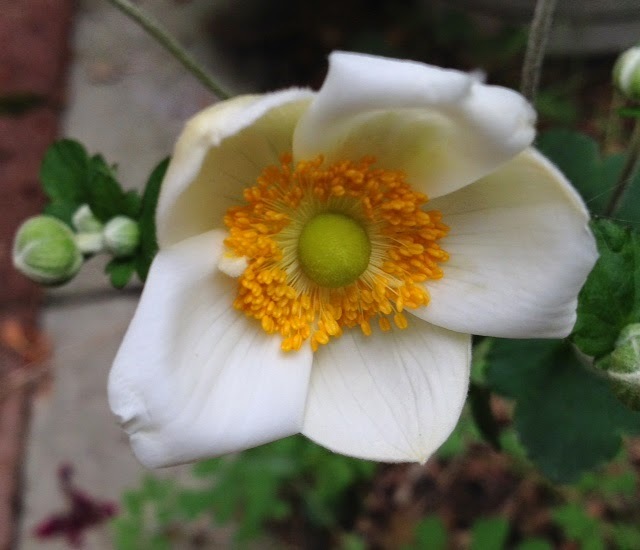 Our first Japanese Anemone flower,opening up just in time for GBBD. This white breaks up all the red and pink we seem to favor. 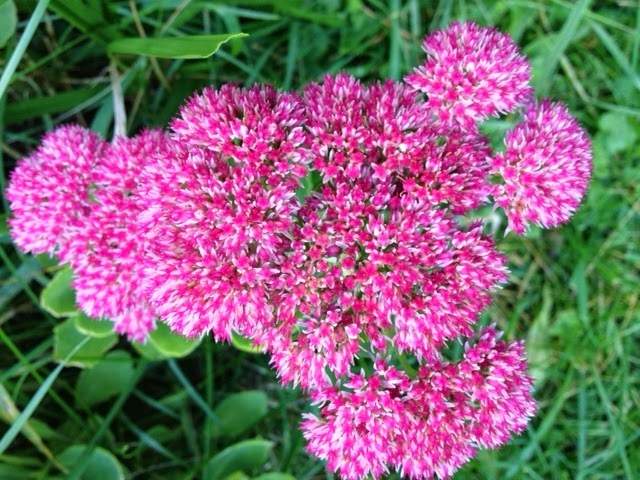 And, for one last pink flower, sedum. It's coloring up nicely. It won't be long until these plants are covered in snow, while the ice cold air whips around them while they sleep. The cold start to today was only a sneak preview of what is to come. Thank you again, May Dream Gardens, for hosting this monthly 15th of the month Garden Bloggers Bloom Day meme. If you like flowers, come join us and see what is blooming all over the world. 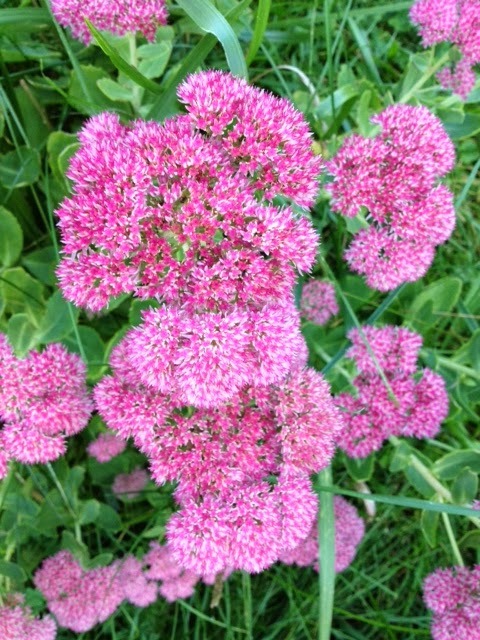 Anything blooming in your house or yard?